Emily is delighted to be part of the Music Together® community! She loves bringing music and dancing into classroom and camp settings, Emily thrives in sharing music with people. She delights in getting to know her students and being able to craft classes that they will enjoy. 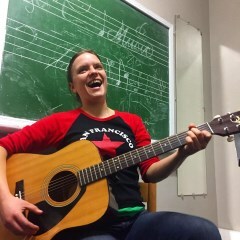 She also sings with a local community choir, plays guitar, and is a singer-song-writer. Emily has studied music with several teachers in the Bay area, including Mark Growden and Sharon Pucci. In her spare time, Emily loves to be out in nature, camping and hiking. "We love teacher Emily! We tried a different class over the winter term but we are back for Sunday's with Emily. My daughter Sydney just lights up when she sees her and has even taken to sitting on her lap sometimes during class. She has really grown to look forward to and love music class and I know that Emily has a lot to do with it. As an adult I appreciate that the class flies by with Emily, and she manages to be genuinely enthusiastic and extroverted the entire time while we all wrangle our kids. She has such a wonderful energy! We look forward to more sunday's to come."